This was a three day cruise from Southampton, calling at Gurnsey in the Channel Islands. It is always a great pleasure to return to a ship that we've enjoyed in the past and find the cruise experience even better than before. Such was the case with this short cruise on Queen Victoria. Queen Victoria is an elegant ship. The interiors, designed by Theresa Anderson, who designed many of the Princess ships, have a traditional elegance. Yet, the atmosphere is alive, not stodgy. Similarly, while Cunard Line is very proud of its traditions, some of which date back to the 19th century, the cruise experience is very much a contemporary luxury vacation/holiday. We did not expect all that much from this short cruise. However, Cunard strove to condense as much as possible of its normal offerings into this short space of time. There was even a speaker aboard to give a taste of Cunard's excellent enrichment program Cunard Insights. Yes, there is more to a longer Cunard voyage but here there was more on offer than could reasonably be done in the time available. In addition, the service was better than we have experienced before on Queen Victoria. When she first entered service, the ship did have some service problems. By the time of our next cruise on Queen Victoria, such problems had disappeared and the level of service was consistent with other premium cruise ships. This was again the case when we returned a few years later. On this voyage, the service level was above that of her peers in the premium segment. The fact that this was a short cruise made this all the more impressive as short cruises put more strain on a ship's crew than longer cruises. Service on Queen Victoria follows the British model. The staff are efficient but are more distant than on ships geared toward the North American market. This is not to say that they are not friendly, but they are not trying to be your buddy. The distance is a mark of respect. Most of the passengers on this cruise were British. However, Cunard attracts an international clientele and so there were also guests from North America and continental Europe. 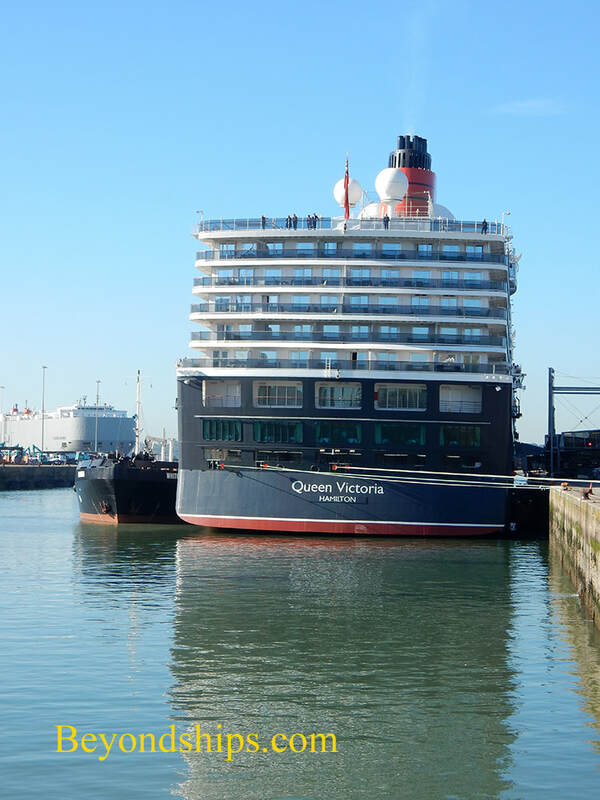 Queen Victoria, like the other Cunard ships, is quite popular among German cruisers. Cunard is sometimes criticized as having “two-class ships.” Such critics imagine that the experience is like in the Titanic movies with the few living in luxury while the masses are down on a dormitory. The way things really are is that the guests staying in the suites have their own restaurants and a separate bar. Everyone is free to use the ship's public areas. This is the same arrangement as on the newer ships of Celebrity Cruises, Norwegian Cruise Line, Royal Caribbean and MSC Cruises. On two nights we had dinner in the Britannia Restaurant, the main dining room. We were seated at a large table during the late seating. Although strangers beforehand, good conversation soon developed. The menu offered variety and the food was tasty. The other night, we had dinner at the Verandah, the ship's specialty restaurant. When the ship entered service, this venue was the Todd English Restaurant. However, after Cunard and the Boston celebrity chef parted company, it became the Verandah. Our first experience at the Varandah on Queen Victoria was disappointing. However, there was no such disappointment this time. The service was excellent and the food both beyond the ordinary as well as quite tasty. The weather conditions during this voyage were mixed, some sunshine but also some rain. Because Queen Victoria was planned as a ship that would include world voyages and long cruises in her itinerary, she was built with additional strengthening in her hull to better withstand the seas that she might encounter. Furthermore, she was built with an additional section that makes her longer than other ships built to the Vista class design and that increases her transverse stability. Therefore, it was not surprising that Queen Victoria had no problem with the conditions encountered on this voyage. The ship showed no visible signs of rust and appeared to be well-maintained. Similarly, the interior was clean and in good condition.